The world’s biggest names in hard-drive manufacturing, for example, operate from Thailand, where suppliers and customers come together. 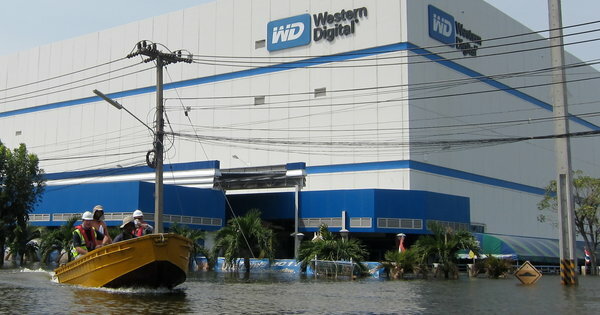 Until the floodwaters came, a single facility in Bang Pa-In owned by Western Digital produced one-quarter of the world’s supply of “sliders,” an integral part of hard-disk drives. Over the weekend, workers in bright orange life jackets salvaged what they could from the top floors of the complex. The ground floor resembled an aquarium and the loading bays were home to jumping fish. “Surely one of the inevitable impacts of this is that never again will so much be concentrated in so few places,” said John Monroe, an expert on storage devices at Gartner, a technology research firm. He estimated it would take a full year for hard-drive production to return to preflood levels. Séb discusses whether Thailand’s floods and Japan’s earthquake will cause companies to geographically diversify their supply chains. This entry was posted in Uncategorized and tagged Supply chain on 7 November 2011 by jdingel.